In the picture postcard village of Blossom Brook, Eliza Bluebell arrives changing the lives of the locals forever. With the help of her playful shadow, Eliza transforms an empty shop on the High Street into the heart and soul of the village. Find out how and read this fantastical story about friendship, butterflies and fairy cakes. Reading this story is a truly magical and uplifting experience that should not be missed. Read it today! Of course, with this being a children’s book, this was a rather fast paced novel, but that did not distract from the adorable story. Eliza Bluebell is a mystery. She travels with her best friend, her shadow, finding people in need and vanishes once she has done all she can for them. The story reminds me a lot of Mary Poppins and Nanny McPhee to be honest, but I loved it none the less. Eliza has come into a town full of people who need a little help. And she helps them in the most adorable ways, never asking for anything in return. Despite it being a children’s book, I thoroughly enjoyed this book and hope that I will be able to find it once I have kids. It brings up the importance of helping others for no reason other than to just help them. It’s a beautiful story about friendship and kindness. There are so many characters and they change a lot throughout the novel. They all become better people, because of Eliza Bluebell. There is an innocent romance that doesn’t go beyond what a child’s mind could comprehend and there is no death. The writing is perfect for a middle grade novel. I loved York’s writing style and how she keeps it simple. This is a short novel, but I was possibly hooked from the very first line. What an amazing concept of a girl and her shadow. I honestly love this cover. It is so simple and so inviting. The cover alone makes you want to pick up the book and find out what it’s about. The blurb perfectly describes what this book is going to be about. 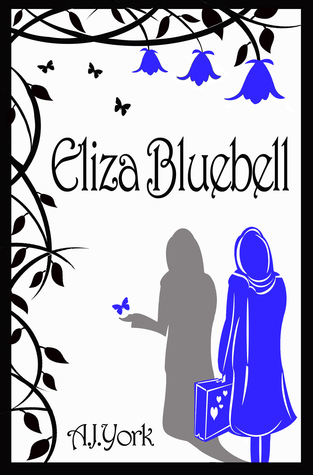 Opening Line: Eliza Bluebell became best friends with her shadow at a very young age. Highlights: Adorable story that made my heart smile. Lowlights: Nothing I can think of. Final Thoughts: If you have kids, this would be a wonderful story to read with them.